Need a Dental Cleaning in Williamsville, NY? Cavities are among one of the most common dental problems we treat as 92 percent of adults have had at least one dental cavity develop in a permanent tooth. Both children and adults are at risk for developing cavities; however, there are some people who tend to be more prone to the development of cavities than others. There are many factors that increase one’s risk for the development of tooth decay. As a result, extra precautions are needed to prevent the destruction of enamel, such as scheduling a more frequent dental cleaning in Williamsville, NY. In order to reduce your risk of cavities, you need to understand what increases your risk for decay to take the necessary precautions. Why Am I Prone to Cavities? Diet—Diet plays an important role in the health and development of your teeth. An imbalanced diet, such as those that lack calcium, will cause the teeth to be weaker than those with a balanced diet. In addition, there are various foods that increase your risk for cavities, such as those that are acidic or contain high amounts of sugar. No matter if you are prone to cavities or not, eating a well-balanced diet is critical to stop the destruction of tooth enamel to prevent cavities from forming. Oral Bacteria—Naturally, there is bacteria in the mouth. However, for some bacteria levels can be increased, such as for those who have dry mouth. In addition, the bacteria found in some can be more aggressive than in others. As a result, high levels of bacteria will essentially attack the teeth, breaking down the protective barrier of the tooth. This is especially true for those who suffer from dry mouth. When the mouth is dry, bacteria thrives, increasing the likeliness for cavity development. Gum Recession—When the gum line recedes, such as in those with periodontal disease, the roots of the teeth become exposed. Not to mention, bacteria becomes trapped in pockets that form in the gum line. This will cause the bacteria in the mouth to increase, making it more likely for decay to develop in these hard to reach areas. Tooth Shape—The natural shape of your teeth also plays a role in cavity development. Cavities often develop in the crevasses of the teeth. Those who have deep groves or an unusually large number of crevasses are more likely to develop cavities in these areas as they are harder to clean. 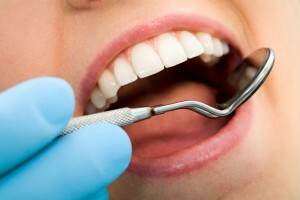 If you are prone to cavities, your dentist in Williamsville, NY offers the preventive care you need to lessen the risk. Contact Amherst Dental Group today to schedule an appointment.